You can configure the Smoothwall to send reports at scheduled times of the day, to specified users and user groups. Both supplied and custom reports can be scheduled. 1. Go to Reports > Reports > Scheduled. • Start date — Choose the month and day to schedule the report on. If this is a repeated schedule, enter the date for the first schedule. • Time — Enter the time, in 24-hour format, for the report schedule. The report is generated only at the time and date specified. The report is generated at the specified time, every day. The report is generated at time specified, Monday to Friday. The report is generated at the time specified, once a week. The report is generated at the time specified, once a month. • Enabled — Click to enable or disable the schedule as required. • Comment — An optional description for the report schedule. • Report — Select the required report for the schedule. • Report shows period — If required, select the required date range. Available ranges are: 1 day, 2 days, 3 days, 4 days, 5 days, 6 days, 1 week, 2 weeks, 3 weeks, 1 month, 2 months, 3 months, 4 months, 5 months, and 6 months. Click the Update button. If the report requires extra information to search against, such as, a specific IP address, you will be prompted to enter it. • Save report — Click to enable this report to be saved to your Smoothwall. Saved reports are found under Reports > Reports > Recent and saved. • Report name — Enter a name for the report schedule. • Publish from portal — If user portals have been enabled for your Smoothwall, you can choose to publish the scheduled report to a user portal. Leave this option as none to ignore all portals. 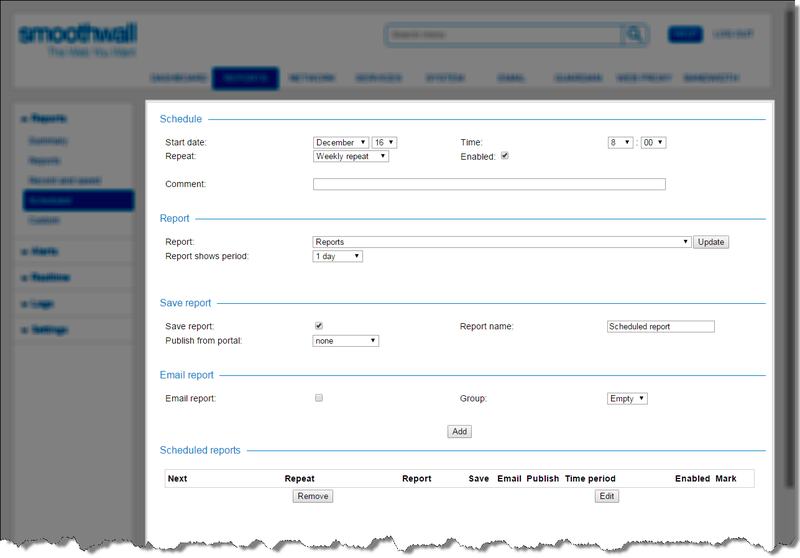 • Email report — Click to create an email scheduled report. • Group — From the drop-down menu, choose the group to email the reports to. For a detailed description of how to setup email groups, see Configuring Alert and Report Groups. 6. Click Add to create the scheduled report. 2. 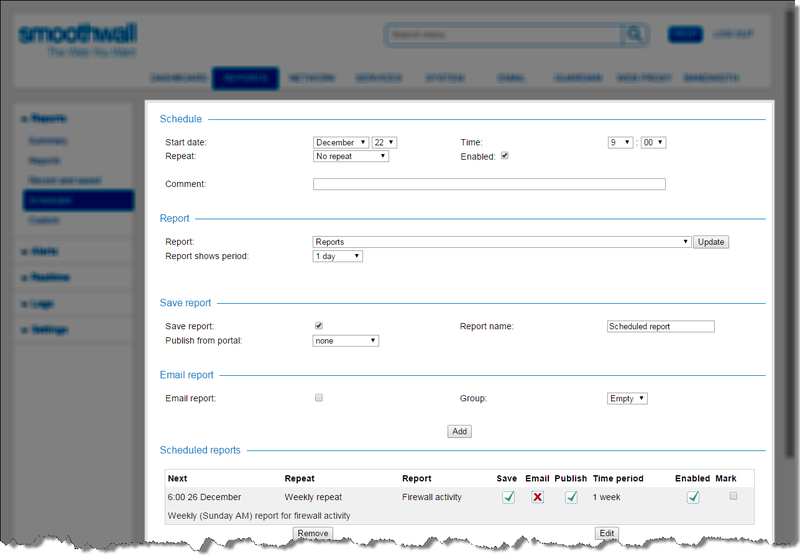 From the Scheduled reports panel, highlight the relevant report, ensuring that Mark is ticked. The schedule details are displayed in the relevant panels. 4. Edit the configuration as required. For a detailed description of each setting, see Scheduling Reports. 3. Click the Remove button. This removes the entire schedule. If you want to keep the report setup but not run the schedules, you can disable the report schedule by editing the report setup and clearing the selection for Enabled.